In today’s episode, we’re featuring Michael O’neal. I interviewed him in the past which you can listen again at F&A episode 016. 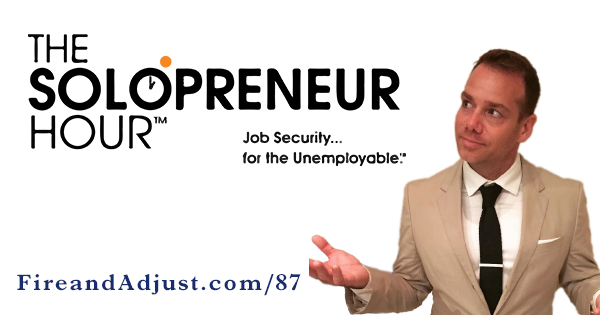 Michael is the host of the popular business podcast “The Solopreneur Hour.” He is coming back to the show to talk about his upcoming book “Either Unemployable or Proudly Unemployable,” a book that helps unemployable people like Michael turn their hobbies and passions into business opportunities. This is one topic we spent a lot of time in the show. I asked Michael about his advice on how veterans can transform their passions into business ideas and he generously offered a step-by-step formula that he himself applied when he was also unsure about his path. Michael shares his story and said that the formula helped him finally decide to be an entrepreneur. Listen to the podcast to learn this easy to follow procedure which Michael advocates. As we explored Michael’s life as an entrepreneur we started talking about the process of outsourcing and looking for great virtual assistants. Michael shares a great sticky note method to identify the perfect assistant for you and your business as well as another method of doing this which he learned from Chris Ducker. Aside from his book, Michael is also launching a new product, called “The Art of the Interview” which he shared on the show. He is also attending Fin Con to talk about the journey of the solopreneur. Michael advised new and aspiring entrepreneurs to attend conferences every quarter and he offers a few pointers on connecting with people at conferences. His pointers are amazing and I think they’ll be useful for anyone thinking about going to similar conferences and getting the most out of them.